The PxPlus WebServer interface serves up Web content and PxPlus functionality without the need for a separate Common Gateway Interface (CGI) utility. Create a dynamic PxPlus-coded Web site that allows browser access to PxPlus as well as other file structuresand do it easily, with minimal knowledge of HyperText Markup Language (HTML). Simply create the Web content using your favourite HTML authoring tool (Microsoft Word, FrontPage, etc.) or by using the PxPlus HTML editor. The WebServer interface enables you to include line label entry points in Uniform Resource Locators (URLs) to redirect processing to subprograms from your Web applications. PxPlus treats variables passed as arguments in your URLs as real variables in your programs. The interfaces coding standards for HTML and for implementing PxPlus applications follow all CGI conventions. The WebServer interface runs as a background process for Windows XP/2003/2008/Vista/Windows 7 & 8, UNIX, or Linux servers and can co-exist with other Web servers. Use it exclusively, or to augment your existing Internet operations. For instance, Apache, Microsoft IIS, or Netscape can serve your main site while your PxPlus WebServer delivers the transaction oriented applications that have access to your PxPlus data. It works with any standard Web browser and offers excellent response time even in heavy traffic. The system can process as many as a thousand simultaneous requests by monitoring up to a hundred ports on a servereach port serving documents and programs from one or more root directories. Provides most of the features and capabilities of the PxPlus Web Server but relies on an Apache or IIS HTTP front end thus a wider variety of web services are supported. The PxPlus WebServer and the PxPlus HTTP server interface are available as an add-on package and is also licensed under the PxPlus eCommerce bundle. 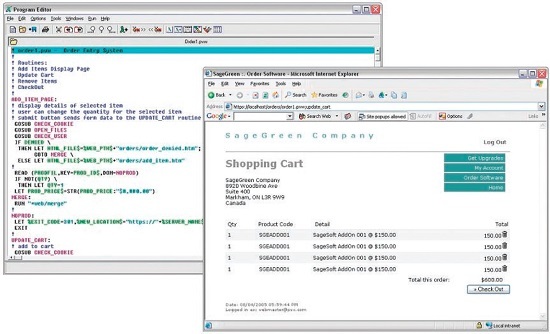 The Apache/IIS HTTP Server interface is also included with the Web Server add-on or as part of the PxPlus eCommerce bundle.